Today, 2nd November 2017, marks the 100th anniversary of the Balfour Declaration. 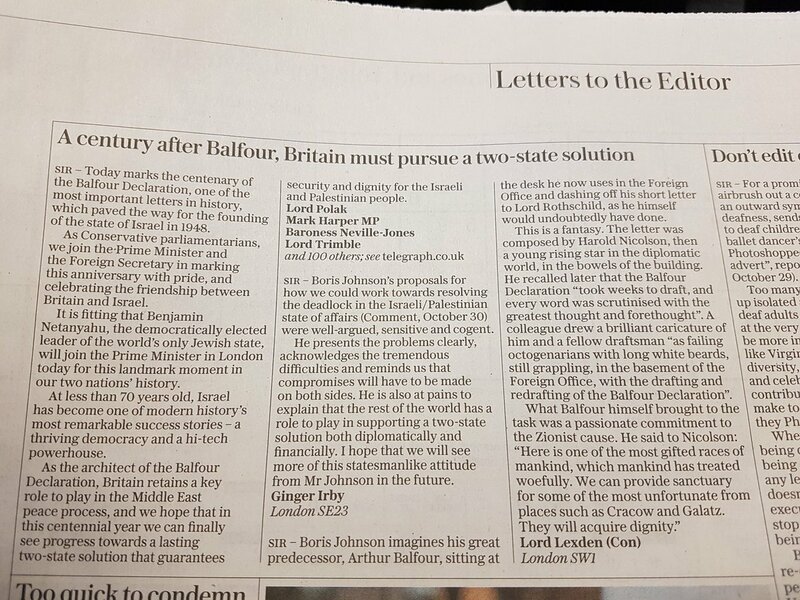 To mark this milestone in the UK and Israel’s shared history, over 100 Conservative MPs and Lords have co-signed a letter published in The Daily Telegraph. The letter – coordinated by Conservative Friends of Israel – celebrates the centenary and the UK-Israel relationship. The Conservative parliamentarians joined the Prime Minister and Foreign Secretary in “marking this anniversary with pride, and celebrating the friendship between the UK and Israel”. 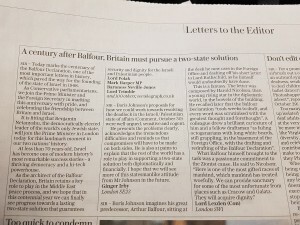 In the letter – “one of the most important in history” – they hail the successes of the Jewish State, which has become “one of modern history’s most remarkable success stories – a thriving democracy and a high-tech powerhouse”. “As the architects of the Balfour Declaration”, they write, “the UK retains a key role to play in the Middle East Peace Process”. They share their hope that this centenary year will be the year “we can finally see progress towards a lasting two-state solution that guarantees security and dignity for the Israeli and Palestinian people”. Signatories of the letter include CFI’s Honorary President Lord Polak CBE, as well as Rt. Hon. Mark Harper MP, Rt. Hon. Baroness Neville-Jones DCMG, Rt. Hon. Lord Trimble, Rt. Hon. Theresa Villiers MP and Nadhim Zahawi MP. The full list can be found below. The centenary today completes a year of celebrations, culminating tonight in a dinner co-hosted by the current Lord Balfour and Lord Rothschild, to be attended by Prime Minister Theresa May and Israeli Prime Minister Benjamin Netanyahu, who is in London at Mrs May’s invitation. The Balfour Declaration was a letter from Conservative Foreign Secretary Arthur James Balfour to Lord Rothschild (as a representative of the British Jewish Community and for passing on to the Zionist Federation) on 2nd November 1917 promising support for the creation of a national homeland for the Jewish people in the land of Israel. Click here to read the letter in the Telegraph. “Sir – Today marks the centenary of the Balfour Declaration; one of the most important letters in history which paved the way for the founding of the State of Israel in 1948. We join the Prime Minister and Foreign Secretary in marking this anniversary with pride, and celebrating the friendship between the UK and Israel. It is fitting that the democratically elected leader of the world’s only Jewish state will join the Prime Minister in London today for this landmark moment in our two nations’ history. At less than 70 years old, Israel has become one of modern history’s most remarkable success stories – a thriving democracy and a high-tech powerhouse. As the architects of the Balfour Declaration, the UK retains a key role to play in the Middle East Peace Process and we hope that in this centennial year we can finally see progress towards a lasting two-state solution that guarantees security and dignity for the Israeli and Palestinian people”.